He has slipped in wet weather whilst on a narrow platform & dropped onto a two inch railing which has struck him across the lower chest wall (right side worse than left). He subsequently fell to the ground on his left side. There was no associated head strike or loss of consciousness & the patient was able to mobilise at the scene to put out a call for help. He is complaining of right sided chest pain & right upper quadrant pain with an associated truncal contusion. Prehospital treatment included: IV access, 5mg intravenous morphine & 250mL Hartmann’s solution. He has a cervical collar and pelvic binder in situ. He is normally fit and well, has no significant past medical history & no known allergies. B: RR 24, SaO2 100%. No subcutaneous emphysema. Good air entry. 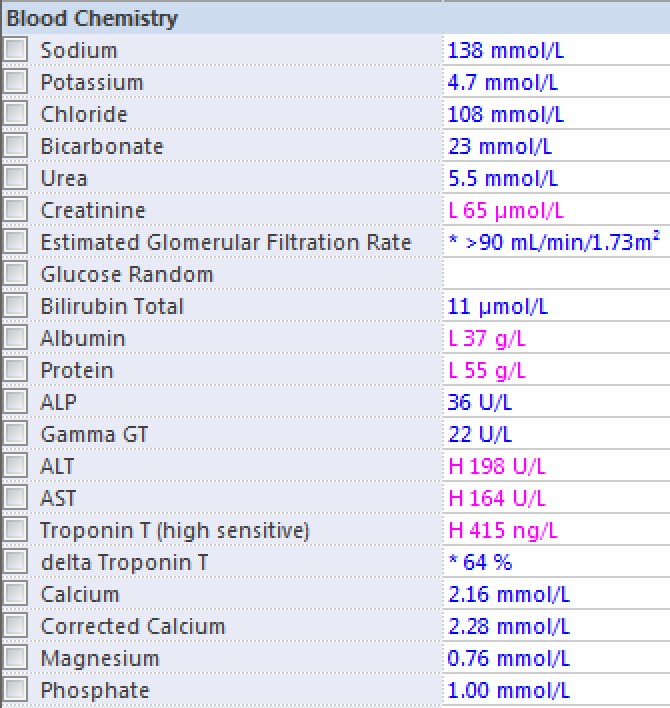 C: P 130-140 (irregular), BP 84 systolic. Warm & well perfused. No long bone #s or external haemorrhage. RUQ tenderness++ (without peritonism). D: GCS 15. PEARL. Moving all 4. E: Afebrile. 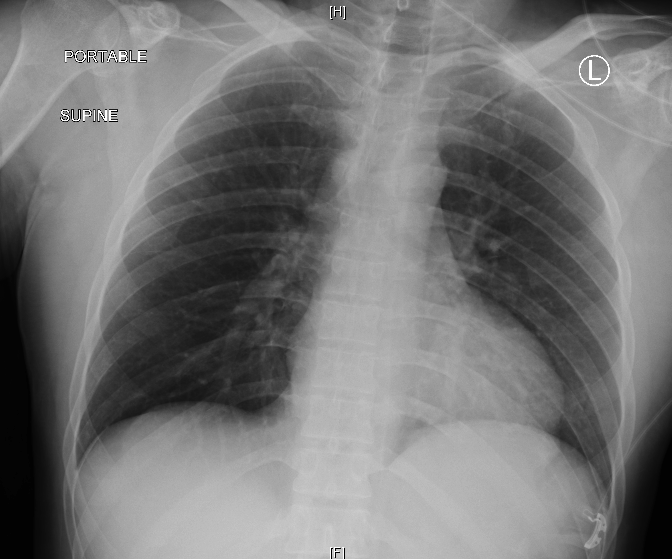 Moderate contusion to lower chest wall (R>>L). Following your teams initial assessment he remains hypotensive (SBP 82mmHg) and tachycardic (130-150bpm, in atrial fibrillation). 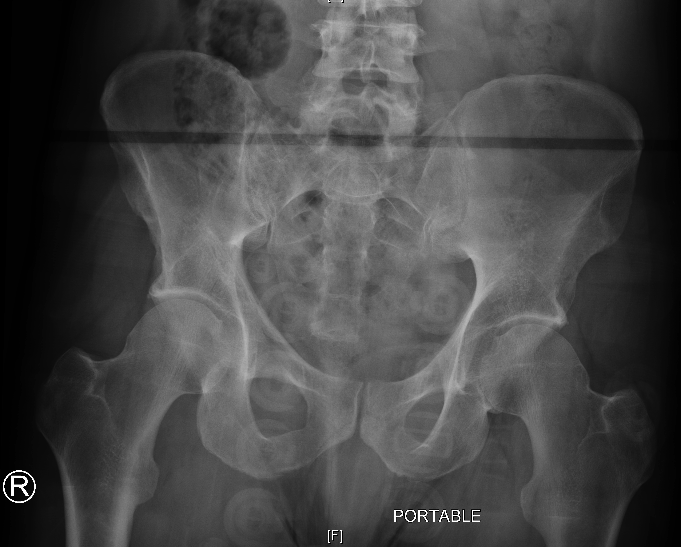 What are your immediate priorities in managing this patient? Send off bloods including VBG, FBC, biochemistry & cross-match. Search for a potential haemorrhagic or obstructive cause for his haemodynamic instability. 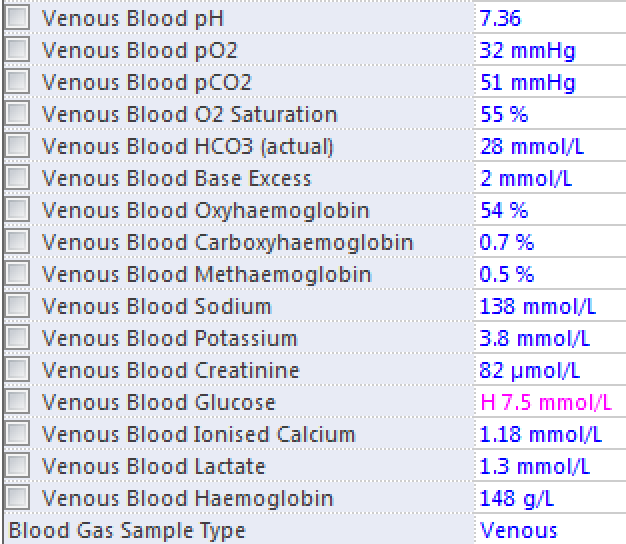 No pneumothorax, intraperitoneal free fluid or pericardial effusion. Irregularly irregular (without obvious P waves). QRS ~ 130msec [RBBB morphology]. Isoelectric PR & ST segments. Atrial fibrillation with rapid ventricular response & right bundle branch morphology. No significant abnormality here that changes management or guides further investigation. Despite a 500mL fluid challenge, your patient remains hypotensive & tachycardic (Pulse 120-150, SBP 88mmHg). You repeat your eFAST scan & it is unchanged. The trauma team decide to proceed with advanced imaging (CT scan) to further elucidate his injuries. No acute intraabdominal traumatic pathology (no free fluid or intraperitoneal gas). No spinal fracture or displacement. Incidental finding of a hepatic haemangioma (identified in his RUQ eFAST scan). In the patient with tachycardia and persistent hypotension, the utilistion of focused bedside echocardiography can delineate the potential underlying causes of shock (hypovolaemic, obstructive, pump failure). Hyperdynamic left ventricle. Mildly dilated RV. No overt intraventricular septal deviation. Hypokinetic right ventricular free wall. IVC collapsibility throughout the respiratory cycle suggesting the patient may respond to a fluid challenge. Hyperdynamic left heart with features of RV dilatation and reduced contractility. In the patient with blunt thoracic trauma, hypotension, presumed new RBBB & a normal CT scan, the following diagnosis must be considered…. Myocardial contusion injuries are a common complication of blunt thoracic trauma. They are caused by a deceleration force to the chest wall resulting in (1) direct pressure on the myocardium or (2) indirect effects of sudden, increased intrathoracic pressures (especially shearing forces). Of note, minimal force may actually be required to cause such a contusion. Blunt cardiac injury encompasses a wide spectrum of clinical manifestations ranging from an asymptomatic myocardial bruise to cardiac rupture and death. They remain a poorly defined clinical entity without a gold standard of diagnosis. It is estimated that up to 20% of all deaths at motor vehicle accident deaths are due to blunt cardiac injury. It is also commonly associated with work-related and industrial accidents, especially falls. These fatalities are largely due to arrhythmias, ventricular free-wall rupture or coronary artery laceration (resulting in extra-cardiac haemorrhage). NB. Myocardial contusions can result from chest compressions during cardiopulmonary resuscitation. The right ventricle (RV) is most commonly injured due to its anterior position in the mediastinum. Cardiac output can drop (up to 40%) as a result of RV failure and preload reduction. This can be compounded by a reduction in the compliance of the LV from a shift in the interventricular septum. The higher pressures of the left heart also make the aortic and mitral valves susceptible to injury (compared to the pulmonary and tricuspid valves). Preexisting valvular pathology makes this more likely. Persistent hypotension with no clear traumatic cause is suspicious of myocardial injury. Haemorrhagic, spinal and obstructive shock MUST to be considered and excluded in these instances. This is especially true in cases with associated significant chest wall and pulmonary injury. Clinically, severe right ventricular dysfunction from myocardial contusion may mimic cardiac tamponade. These complications may arise immediately or delayed (even up to years post-injury). With the spectrum of complications arising from myocardial contusion as well as the possible concomitant traumatic injuries there is a wide range of clinical presentations and variable physiological consequences. You must consider a valvular injury (or one to papillary muscles, chordae or septum) in patients’ with a new murmur or pulmonary oedema following blunt chest trauma. The definitive diagnosis of myocardial contusion can only be made on gross or histological examination of the hear. There remains no sensitive diagnostic test to clearly identify myocardial contusion or to predict those patients with the potentially lethal complications. In patients with myocardial contusion, 40–83% have abnormal ECGs. Arrhythmias are the most common abnormality observed, usually occurring in the first 24–48 hours. There is no correlation between the complexity of arrhythmias and the degree of cardiac contusion, however atrial fibrillation is associated with a poor outcome. Right bundle branch block is common followed by first degree heart block, right bundle branch block with hemiblock and third degree heart block, respectively. Contusions to the left ventricle may manifest as ST-T wave abnormalities, diffuse ST changes as seen in pericarditis, or as pathological Q waves. Several studies have demonstrated abnormal transoesophageal echoes in patients with blunt thoracic trauma and normal presenting ECGs (24-41%). An admission electrocardiogram (ECG) should be performed on all patients in whom BCI is suspected. If the admission ECG reveals a new abnormality, the patient should be admitted for telemetry. ECG alone is not sufficient to definitively rule out BCI (NPV ~95%). CK-MB is specific for myocardial and skeletal muscle trauma, and is a particularly good marker of cellular injury because it increases and peaks in the first 24 hours and decreases to normal levels within 72 hours. However, CK-MB levels are usually elevated in trauma patients because of multiple injuries & the source of the enzyme may be due to non-myocardial sources, making CPK-MB a non-specific marker of cell injury. There are also conditions in which CK-MB may be falsely elevated. Serum cardiac troponin is highly specific for myocardial injury. Previously, Troponin I was able to detect cardiac injury in patients with blunt chest trauma accurately (Sn 100% & Sp 97%) in a group of 44 patients using echocardiography as a reference for the diagnosis. There is however ICU data demonstrating elevated troponin in intubated trauma patients without echocardiography or ECG changes, raising the possibility of either false positive elevations (or Type 2 rise) OR a subclinical contusion. Recent studies show that ECG alone is not sufficient to definitively rule out BCI. This recommendation is based on data from four studies representing more than 500 prospectively studied patients. One study has looked at the use of troponin I in the paediatric trauma population. It found that elevation correlated with higher injury severity and need for interventions but did not correlate with abnormalities on cardiac echo and was not useful in detecting cardiac injury. The addition of troponin I to the workup for BCI increases the NPV to 100%. Elevated troponin seems to be a formal indication for echocardiography. Troponin may be elevated for other reasons in trauma patients. Do not use in paediatric patients. Echocardiography is a valuable tool in the assessment of cardiac function after BCI. Unfortunately, echocardiography has little utility as a screening test for clinically significant BCI in the haemodynamically stable patient. TTE is useful in diagnosing myocardial contusion, assessing ventricular function & detecting pericardial effusion. TTE has identified myocardial contusion in up to 26% of patients with blunt chest trauma & pericardial effusion in up to 15%. It rapidly differentiates contusion from effusion in the overtly shocked patient with blunt thoracic trauma. Potential limitation is the association with poor-quality images secondary to accompanying chest injuries. TOE provides high-quality images when transthoracic windows are poor, but is semi-invasive and not always possible in the emergency department or resuscitation bay. Summary: Echocardiography is not useful as a primary screening modality but rather as a diagnostic test for patients who have unexplained hypotension or arrhythmias. Using radionucleotide imaging, concentrated areas of 99mTc- pyrophosphate or reduced areas of perfusion may indicate the presence and extent of myocardial damage. These scans do have high false negative rates. Summary: Nuclear medicine studies add little when compared with echocardiography and should not be routinely performed. In patients with a normal ECG result and normal troponin I level, BCI is ruled out. The optimal timing of these measurements, however, has yet to be determined. Taken from Schultz & Trunkey (2004). Taken from Bansal et al (2005). A note about STERNAL FRACTURES. Five studies evaluated the relationship of sternal fracture to BCI. Four of those studies concluded that sternal fracture was not a marker for BCI. The presence of a sternal fracture alone does not predict the presence of BCI and thus should not prompt monitoring in the setting of normal ECG result and troponin I level. Cardiac contusion is typically associated with significant extra-cardiac trauma, therefore resuscitation and clinical management will largely be dictated by these concomitant injuries. The clinician should focus on maximising oxygenation & ventilation, optimising perfusion, arresting haemorrhage as well as the provision of sound neuroprotective measures. Myocardial contusions with minor ECG or cardiac biomarker abnormalities rarely produce clinically significant sequelae. These minor abnormalities usually resolve without any intervention within 24 hours. Myocardial contusion with shock requires a precise understanding of the preload and afterload characteristics of both ventricles. Invasive cardiovascular monitoring and echocardiography will guide this assessment. Haemodynamic support in the setting of confirmed or suspected myocardial contusion is centred around judicious fluid administration and careful inotropic support. Intraaortic balloon pump counterpulsation has been used in some patients with refractory cardiogenic shock. Arrhythmias may be a result of direct myocardial injury, or can occur because of electrolyte or acid/base disturbances, hypoxia or intoxication. Each of these should be addressed when managing these patients. DC cardioversion should be avoided if possible. Extreme associated cardiac injuries may require cardiothoracic surgery or interventional angiography. With all potential significant traumatic causes for hypotension largely excluded by his advanced imaging the diagnosis of myocardial contusion was made & later confirmed by a formal transthoracic echo demonstrating a mildly dilated right ventricle with moderate systolic impairment. Of note, his left ventricular size and function was normal. 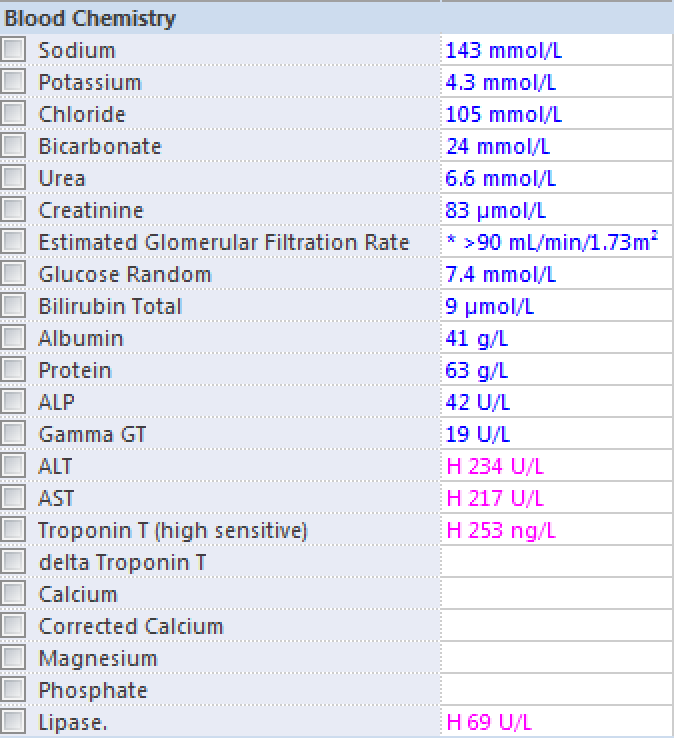 His hypotension was responsive to fluid boluses & he did not require inotropic support. He was admitted to a high-dependency bed and was reviewed by Cardiology and Intensive Care, who decided to treat his atrial fibrillation with amiodarone. 24 hours into his admission he reverted back to sinus rhythm. Serial echo demonstrated the interval development of a small pericardial effusion without features of tamponade. This was merely observed and did not require intervention. He was discharged home on day 5. Note the resolution of the right bundle branch block. Schultz, J. M., & Trunkey, D. D. (2004). Blunt cardiac injury. Critical Care Clinics, 20(1), 57–70. Rosen, C. (1993). Significance of myocardial contusion following blunt chest trauma. Annals of Emergency Medicine, 22(7), 1243. Feghali, N. T., & Prisant, L. M. (1995). Blunt Myocardial Injury. Chest, 108(6), 1673–1677. Bansal, M. K., Maraj, S., Chewaproug, D., & Amanullah, A. (2005). 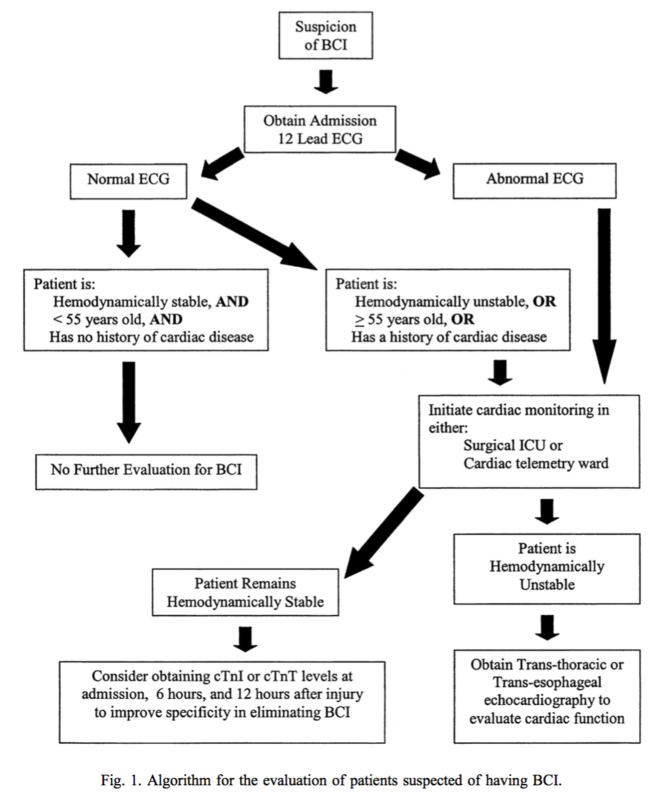 Myocardial contusion injury: redefining the diagnostic algorithm. Emergency Medicine Journal, 22(7), 465–469. Kaye, P., & O’Sullivan, I. (2002). Myocardial contusion: emergency investigation and diagnosis. Emergency Medicine Journal, 19(1), 8–10. Cane, R. D., & Buchanan, N. (1978). The electrocardiographic and clinical diagnosis of myocardial contusion. Intensive Care Medicine, 4(2), 99–102. Clancy, K., Velopulos, C., Bilaniuk, J. W., Collier, B., Crowley, W., Kurek, S., et al. (2012, November). 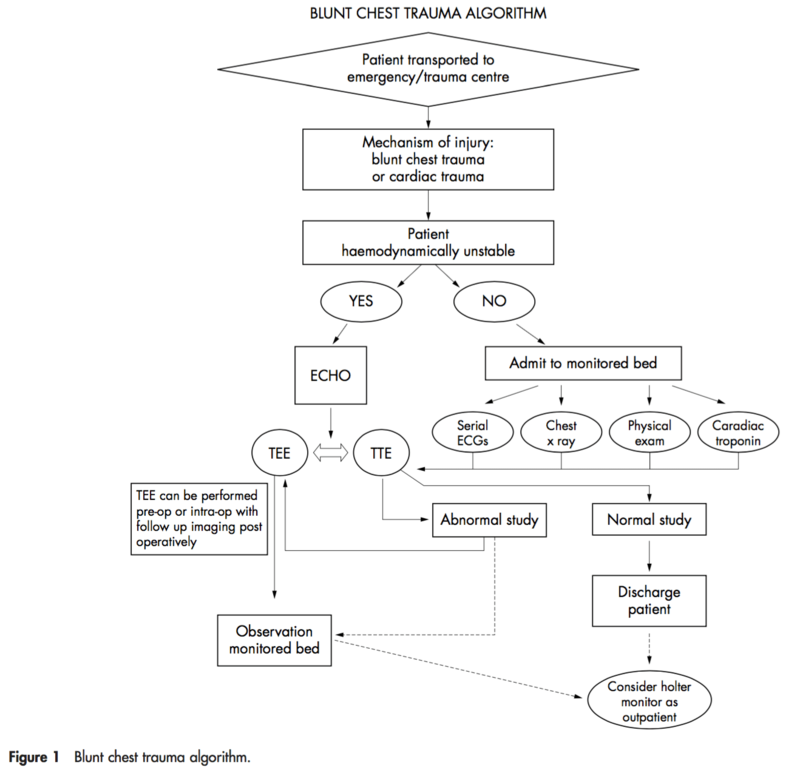 Screening for blunt cardiac injury: an Eastern Association for the Surgery of Trauma practice management guideline. The Journal of Trauma and Acute Care Surgery. Edouard, A. R., Benoist, J. F., Cosson, C., Mimoz, O., Legrand, A., & Samii, K. (1998). Circulating cardiac troponin I in trauma patients without cardiac contusion. Intensive Care Medicine, 24(6), 569–573. Goldberg, S. P., Karalis, D. G., & Ross, J. J. (1993). Severe right ventricular contusion mimicking cardiac tamponade: the value of transesophageal echocardiography in blunt chest trauma. Ymem, 22(4), 745–747. I was wondering what inotropic support you would use in a similar case? I’d try & keep things simple! Low-dose adrenaline or noradrenaline (depending on the presence, or not, of a tachyarrhythmia). Hi Chris hope you are well. Really interesting case. Great presentation. Excellent learning points. I think myocardial contusion often forgotten about in these patients.